When looking for a convenient and economical way for your group to travel to a certain destination, charter bus rentals are a popular option. After all, when compared to other travel options, they’re the least costly way to travel. While public transportation costs each passenger 77 cents in federal taxpayer subsidies and commercial airplanes cost just over four dollars per passenger, charter buses only cost each passenger six cents per trip! That being said, finding an affordable charter bus company to take you to your destination should not be too difficult. 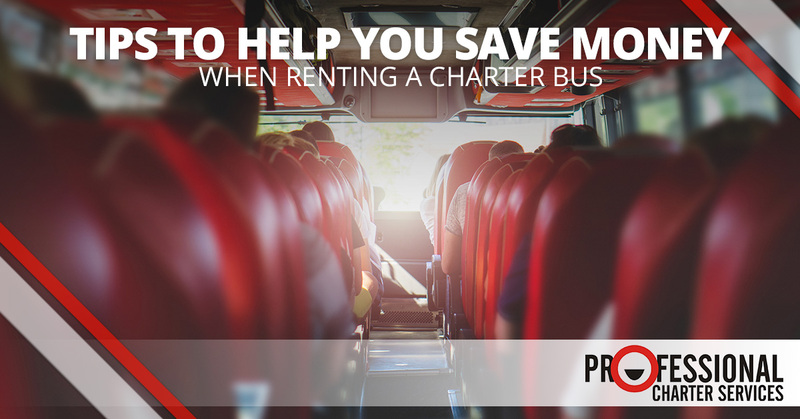 Still, even with the money your group saves, there are some additional ways you can keep cash in your wallet when renting a charter bus. In this blog, we are going to share three money-saving tips when it comes to renting a bus from a chartering service. There are a variety of factors that are considered when determining the cost of a charter bus rental, including the destination and duration of the trip and the season. However, one important factor is the availability of the charter bus fleet. Booking in advance, when charter bus rentals are still widely available, can help you save money, especially during the peak season when more people are looking for group travel options. By booking charter buses months ahead of your trip date, it is possible to receive a lower rate than you would be doing so at the last minute. Plus, if you’re traveling with a large group, this is especially important, as this will not only get the best available price for everyone but will give you a better availability and selection of charter vehicles and destinations. When planning travel accommodations for a group trip, it can be tempting to overestimate the space and the features needed during a trip. Large, charter coach bus rentals may be great and offer a lot of room and amenities, but depending on the size of your group and your budget, you could potentially be paying more than what is actually needed. For shorter trips and smaller groups, you may want to consider a charter mini bus rental. For longer trips, you should reserve a charter bus that fits the needs of your group exactly, without overestimating or underestimating. If you are unsure which bus is the right size for your group, contact a professional bus charter service for assistance — they’ll be able to recommend the right charter vehicle to ensure your group has everything needed for a comfortable and enjoyable trip! Another potential way to save money for your trip is to add group members. For example, if you reserve a charter bus that can accommodate 56 passengers, you’ll want to try to get your passenger count as close to that number as possible. Otherwise, each person will technically be paying more for their trip. Of course, you will save even more money by getting an exact headcount in advance. However, if that isn’t possible or you have to book a bus that’s bigger than the finalized group, you could end up saving more money by adding members to your group! Ultimately, the charter bus rental is going to cost the same total price, however, it will cost less per passenger if you ensure you are at or near full capacity.